Enjoy my first Vlog, I look, sound and act super silly. I was nervous. Reducing waste is so easy to do. I challenge everyone for a week to really watch what you are throwing out and before you throw an item out, look at it and see if there’s another use for it. When planning an event, really think about all the ways you can save on paper and food products. Try out composting, if works for everyone, even though it does sound super overwhelming at first. Make sure you are recycling. Use plastic containers to take your lunch to work, not only do you save on paper waste, but you save on calories, think about it, if you know what you are taking everyday, when you prepare at home you have a much better gauge on your calories then ordering out. Not to mention if you don’t eat all your take out, that adds up to a lot of waste in a years time. By planning your lunches and using plastic containers you can always save if you don’t want to eat it all at once. Hope you enjoyed this series of post! I’m glad I was able to particpate with the Foodbuzz Tastemakers Program and Glad One Bag Event! Do you compost? I didn’t until now. To be honest, it was something I was afraid of. It seemed very overwhelming and like a huge extra job. I also had fears that my kitchen would get stinky very fast and I’d be inviting fruit flies into my house with open arms. Not to mention we currently live in a townhouse, so where would I put a composting bin outside. After speaking with Keiko, from Waste Management, she eased my fears the second I started to question her about it. It truly is SUPER simple. Even in a townhouse! 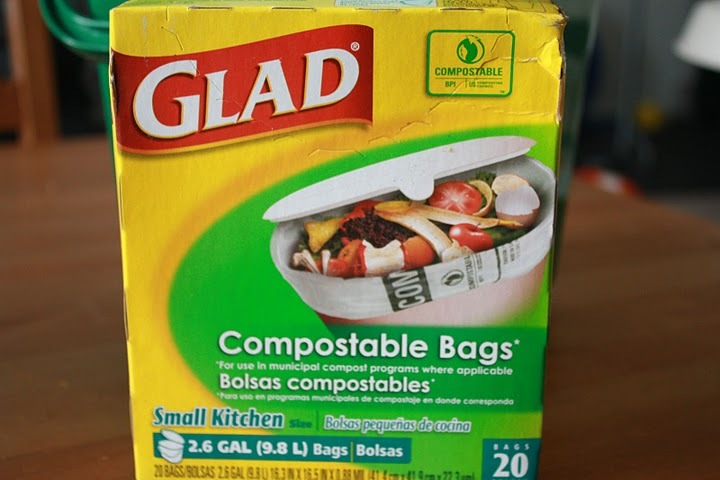 Part of the Glad One Bag Event and Foodbuzz Tastemakers program, was to reduce waste by composting. Glad sent us this cute little green compost bin and compostable bags. My first question to Keiko was, would this make my kitchen stinky? She told me no way! For one it’s not like you keep the compost in your house, just the bin, after its full take it outside and put into a larger compost bin or if you are like me with limited yard space, just by a gallon Rubbermaid container. Also if your compost bin inside your home starts to get stinky, add some baking powder to it. Also it’s recommend that you do not keep your bin inside for longer than a week. 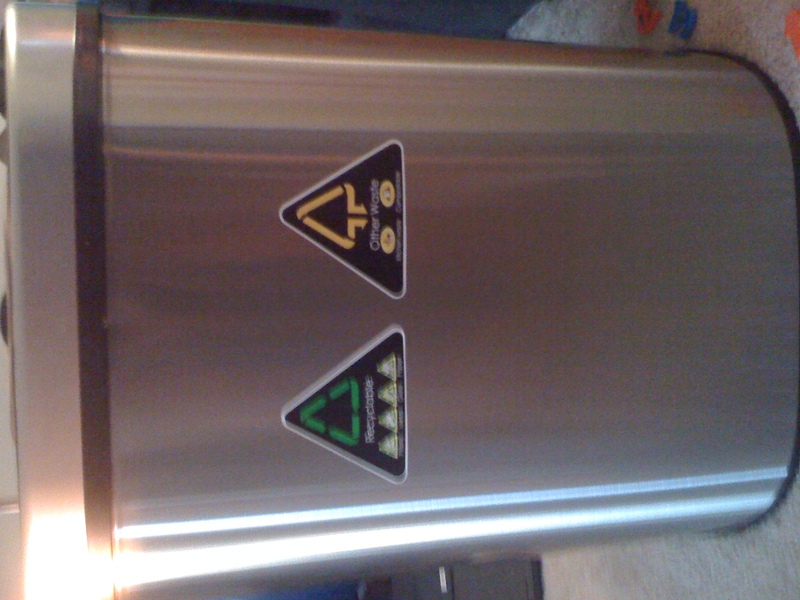 The bin that Glad sent, has a filter on the top that you do need to change every 3 months. Once you are ready to take it outside, make sure you have the exact amount of wet to dry products, meaning for as much food waste you put into compost bin, make sure you have the same about of dry material, such as leaves. If you don’t have any leaves you can use newspaper. 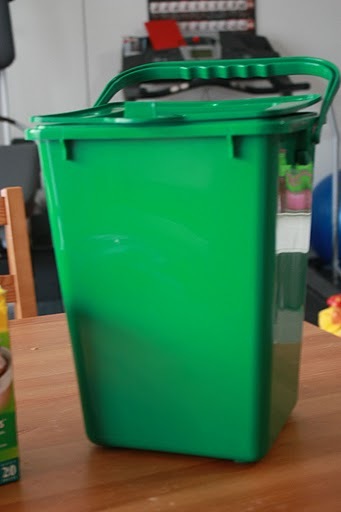 Before you begin composting make sure to make 8-10 holes in the top of your bin and place leaves or newspaper, halfway up into the container as a base. Then place food on top and place dry material on top. So what can you compost, just about anything, vegetable rinds, fruit peels, egg shells that are finely broken up, just about anything but do avoid meat or dairy products as they can attract unwanted guest to your yard. It will take about 3-4 months for your compost to turn into mulch. Once it does use it around your gardens as mulch. See it’s not really that bad and it’s super easy to start! So reduce waste today and start composting! Again, as a member of the Foodbuzz Tastemakers Program and Glad, I received the composting bin and bags complimentary. To be honest, when I think of frozen meals. I typically think, yuck. Who would want all that over processed food for a meal? How is that healthy? So when I had a chance to test out the Birds Eye Viola Skillet Meals as a member of the FoodBuzz Tastemakers Program, I gave it a shot. I tried of the Cheesey Chicken. It was actually pretty good. 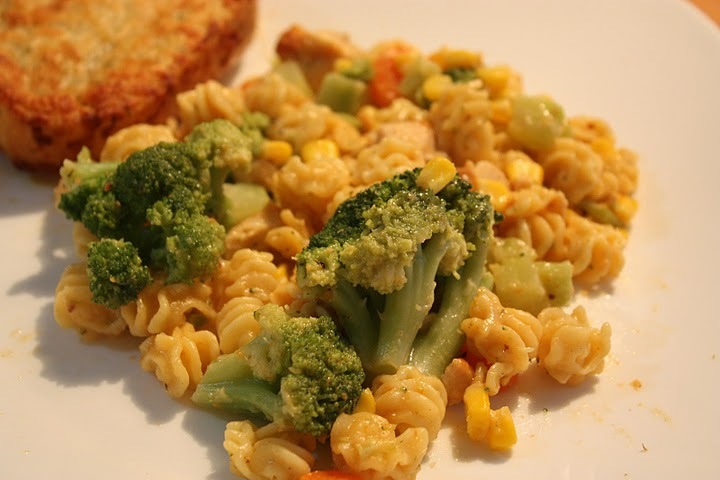 It has all fresh ingredients and for 1 serving it only has 111 calories. Pretty decent, right? There are a TON of different flavors, check out their website here! Check them out today in the frozen food section at your local grocery store. As part of theFoodbuzz Tastemaker Program, I received a coupon for a free Birds Eye Viola Skillet Meal. Labor day weekend is the last hurrah at the cottage basically, so we had to go big with the recipes we cooked that weekend. Wait, what am I talking about? 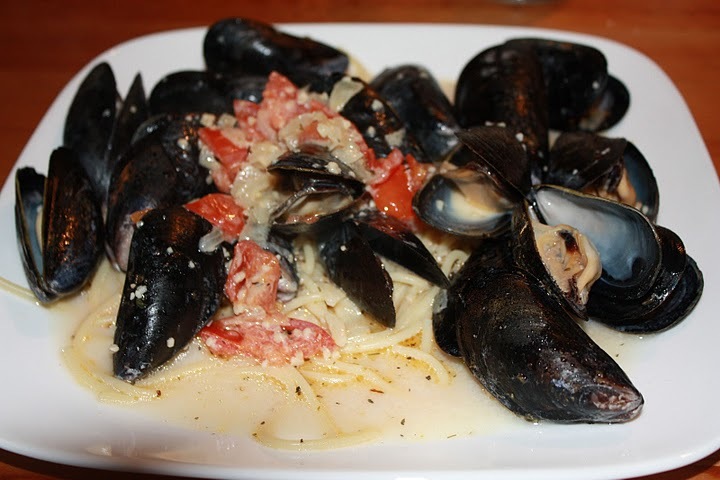 We always have something super creative or fancy when eating at the cottage. 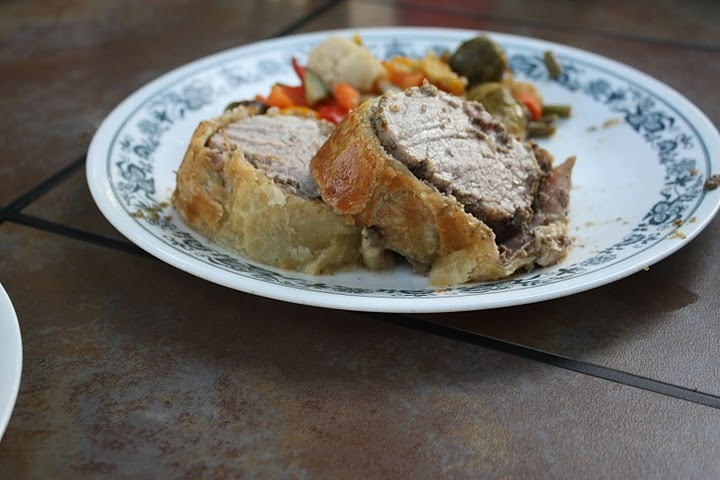 My husband and brother-in-law where deciding what make and my brother-in-law, Danny, decided he wanted to make a Pork Wellington. So this is a guest post of sorts, Danny made the meal for us all to enjoy. Just as a note, we doubled the recipe to serve enough people, this served about 8-10 people, so if you are making for less, half the ingredients. I really wish I would have been able to take pictures of the whole process cause it can be a bit overwhelming, but very enjoyable and delicious in the end! Heat a few tablespoons of olive oil in large pan over high heat. Season the tenderloin, don’t be shy, with salt and pepper. Sear the tenderloin on all sides until browned. Remove from pan and let it cool. Once cool brush all sides of the tenderloin with the mustard. Chop the mushrooms and put them into a food processor and puree. Heat a large skillet on medium high heat. Scrap the mushroom puree into the skillet and let it cook down, allowing the mushrooms to release their moisture. When the moisture is released, set the mushrooms aside and let them cool. Roll out a large piece of plastic wrap. Lay out the slice of ham on the plastic wrap so they overlap. Spread the mushroom mixture over top of the ham. Place the tenderloin in the middle , roll the mushroom and ham over the tenderloin, using the plastic wrap so it’s tight. Twist the ends of the plastic wrap to secure. Refrigerate for 20 minutes. On a lightly floured surface, roll out the puff pastry sheet to size that will wrap around the tenderloin. Unwrap the tenderloin from the plastic wrap and place in the middle of the puff pastry. Brush the edges of the puff pastry with the beaten eggs. Fold the pastry around the tenderloin cutting off an excess pastry. Any pastry that is more than 2 layers will not cook properly. So try to limit the overlap. Place on a small plate, seam side down and brush beaten eggs yolks over the top. Chill for 5-10 minutes. Place the puff pastry filled tenderloin on a baking pan. Score the top of the pasty with a knife, not going through the whole pastry. Sprinkle the top with coarse salt. Bake for 25 to 30 minutes or until the pork has an internal temperature of 140. Remove from oven and let it rest for 10 minutes before slicing. So the party was a success! We were able to get all of our waste into one bag! 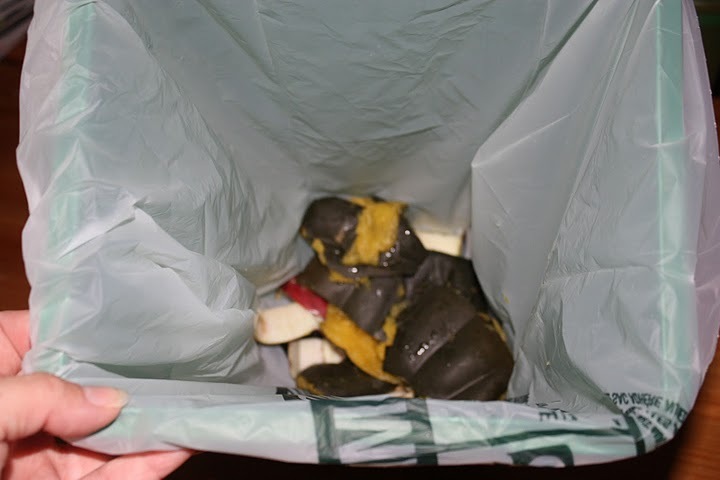 I never thought a birthday party could ever be put into one bag of waste. I mean there is SO much stuff that goes into a birthday party that ends up as waste and typically there are bags and bags of waste. So how did we do it? Very easily actually, more easily then expected! So to start, instead of sending out paper invites, use the website Evite.com. You can create all kinds of neat invites on there and guest can even RSVP back to the website. You can set up directions and messages to your guest. This saved me on about 3-4 packages of paper invitations. To reduce paper waste of wrapping paper, it was super easy to put on the invitations that guest should use minimal packaging or use newspaper which is recyclable. They can wrap their gift in a scarf that might be able to used later as an accessory. Tell guest, not to bring birthday cards, as for the most of the time, they do get put into the garbage. Have guest bring a book and write a greeting into it. Next, make sure you get an accurate count of guest. This will reduce your food waste. Grab some local produce and veggies at local farmer’s markets, because you will have less waste from all the packaging from products if you bought them at store. Use your own cloth shopping bags also to reduce waste. All of your food scraps try to put into a composting bin(stay tuned for a post on composting!) For drinks, use pitchers to put drinks into to reduce waste of cans and bottles. So easy to whip some sangria or even soda and place in pitchers and guest can serve. Use glassware instead of plastic ware to reduce a ton more of paper waste. For decorations, ask friends and family if they have any leftover. If not, create some of your own with items you have at home. Like maybe that box, break out some markers and use them to create banners. If you have leftover food, send it home with guest, instead of throwing it out. Bake your own cake at home to save on waste from cake box packing and if you need to order a cake, it’s ok, use the box to store things in after, of course after you lick all that yummy icing off! Let children use to play with to store toys, or even make something out of! If not save it for the next time you make some baked goods at home, you will have a storage place for them! So as you can see it was a challenge at first to reduce the waste from a birthday party, but it was totally doable and also as I was planning more and more ideas would come to mind on how to save on waste.